Our digital age requires an analog flame. The Lindy Effect, named for a longstanding New York deli, is the idea that the longer an idea or practice has survived, the longer it will survive into the future. It’s why, despite fidget spinners being the talk of the summer, jump ropes are much more likely to be around in 50 years. Newfangled technology may thrill us, but it’s the allegedly boring, familiar stuff that lasts, burrowing into our routines and longings. The really, really old stuff even burrows into our evolutionary makeup, marrying its survival with our own. This is the case with humanity’s oldest and greatest technological achievement: fire. Fire ushered in cooking, radically reducing chewing time. It provided a new way to ward off predators, lengthening our lifespan. It heated and lit us up, increasing how far we could travel. It not only changed our lives, it changed our bodies: our brain and stomach size evolved to fit our newfound ignition. In hot seasons, the cool of the evening releases pent up energy; in cold seasons, people huddle together. Fireside gatherings are often, although not always, composed of people of mixed sexes and ages. The moon and starlit skies awaken imagination of the supernatural, as well as a sense of vulnerability to malevolent spirits, predators, and antagonists countered by security in numbers. Body language is dimmed by firelight and awareness of self and others is reduced. Facial expressions — flickering with the flames — are either softened, or in the case of fear or anguish, accentuated. Agendas of the day are dropped while small children fall asleep in the laps of kin. Whereas time structures interactions by day because of economic exigencies, by night social interactions structure time and often continue until relationships are right. Thanks to fire, humans had time to talk through their emotions about themselves and each other. We could start bonding within and between groups. We could create and pass along culture and tradition. Without fire, all the stuff we like about being human might never have happened. As the nightly campfire has come to be replaced by gas light, lightbulbs, and, eventually, the blue glow of screens, we, as a species, have forgotten about the joys of this special time of night: campfire time. However, our bodies and minds have not forgotten. Anthropologists at the University of Alabama have found that sitting by a campfire lowers blood pressure and other stress indicators: the longer we sit by the fire, the more relaxed we become. This mirrors studies about what happens to us in all natural environments: fire, like the woods generally, produces what researches call a “soft fascination,” modestly grabbing our attention while allowing the analytical parts of our brain to rest. This is the “restoration theory” of nature: nature allows the always-on, critical part of our minds to take it easy, while prodding the long-dormant, open-ended part of our minds to come alive. As Wiessner mentions at the end of her study on the early social effects of fire, the Danish idea of hygge, or coziness, calls for the heavy use of candles to, like the fires of old, “stimulate intimate conversation.” The culture of ghost stories around the campfire, too, reminds us how well burning embers pair with being open to strange and fruitful thinking. It’s no wonder that the oldest way of gathering has lasted this long: it relaxes us, warms our hearts and takes us to another plane. 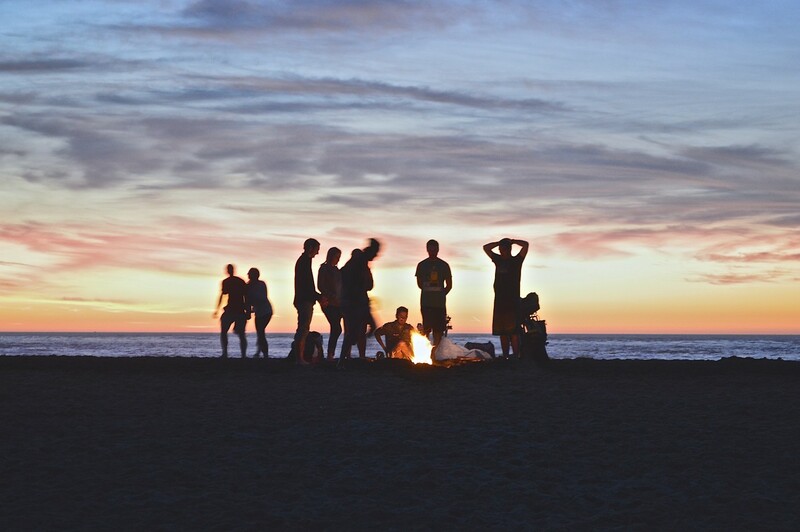 And, in line with the Lindy effect, gathering around the campfire is likely to outlast the latest wellness crazes, continuing to be humanity’s go-to way to escape and rejuvenate. Perhaps all the answers you need are not inside of your cellphone screen, but rather among the sparks and flicker of your next moonlit blaze.